Mayfield has yet to put up a huge fantasy line, but throwing for over 340 yards against the Ravens is no easy feat. Baltimore gave up just one 300-yard passing game all of last year and has yielded just five multi-touchdown passers since the beginning of 2017. The gutty OT win only added to Mayfield’s early-career mystique, and now it’s time for the fantasy goodness to follow. In the next five weeks before Cleveland’s Week 11 bye, Mayfield will face the following opponents (rank vs. opposing QBs, in terms of fantasy points allowed, in parentheses): vs. Chargers (23rd), at Buccaneers (32nd), at Steelers (30th), vs. Chiefs (29th), vs. Falcons (28th). In other words, in the next five weeks Mayfield faces a bottom-10 pass defense allowing averages of 284 yards and 2 touchdowns passing per game (Chargers), followed by four of the five worst pass defenses in the NFL. He should be owned in all formats at this point. Charch’s Blind Bidding Recommendation: 20%. In QB-heavy leagues, 30%. Beathard is a horrendously bad NFL quarterback. In two starts, he has thrown four interceptions and fumbled three times (losing two). But, to a certain extent fantasy owners don’t care that much about the turnovers as long as the stats pile up. And pile up they have for Beathard, who has thrown for at least 298 yards and 2 touchdowns in each of the last two weeks, tacking on a rushing score to boot in Week 5. The vast majority of his damage is being done in garbage time, but garbage time stats count just the same. With Matt Breida injured, Beathard will likely throw a few extra times. Beathard is only a desperation option in 2-QB formats or in case of disastrous bye week issues, but you could do worse. Charch’s Blind Bidding Recommendation: 3%. In QB-heavy leagues, 5%. Clement has been banged up throughout most of the season, missing Week 4 entirely and then suiting up but not playing a snap in Week 5. His ownership is down to just 28%, which is about to skyrocket with the news of Jay Ajayi’s season-ending knee injury. Clement has run clearly ahead of Wendell Smallwood when healthy, and with Ajayi out of the picture the Eagles backfield is at least slightly less confusing than it had been. There’s still the prospect of Darren Sproles’ eventual return to deal with, and there’s the fact that Smallwood has looked great in small doses over the last three weeks. Clement should still be your No. 1 target if you’re an Ajayi owner, but going all-in probably isn’t the best approach given all the other tentacles here. Clement practiced in full on Monday, which is very important on a short week heading into Thursday night’s game against the Giants. P.S. I’m not buying the Le’Veon Bell trade rumors. Charch’s Blind Bidding Recommendation: 35%. 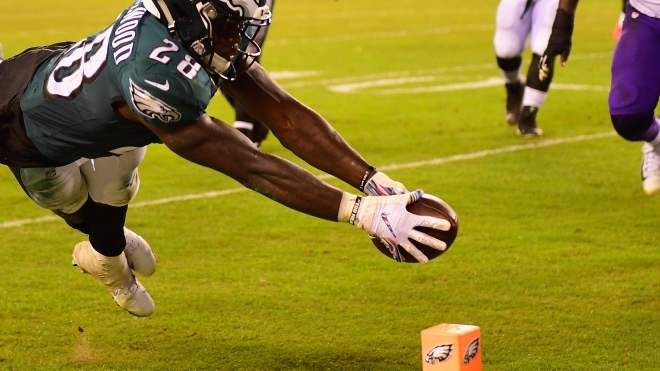 Smallwood is making the most of his limited touches in the Eagles backfield. He’s averaging 6.8 yards per rush, has 3 catches in each of the last three games, and scored his second touchdown in three weeks against the Vikings in Week 5. With the surprise Monday announcement that Jay Ajayi is lost for the season with a torn ACL, Smallwood suddenly comes into a focus as a near must-add for anyone seeking running back relief. He’ll still have to battle Corey Clement and Darren Sproles (who has now missed four straight games with The World’s Most Severe Hamstring Injury) for playing time, but the picture is suddenly more clear with Ajayi out of the mix altogether. I’d bet on Clement to be the more productive of the two backs over the long hall, but both will have fantasy value moving forward. Charch’s Blind Bidding Recommendation: 30%. Ugh. The snake-bitten 49ers appear to have lost another promising player to a multi-week injury. This time, it’s running back Matt Breida, whose ankle sprain could sideline him for 2-4 weeks. Morris, who had been severely outplayed by Breida in the last couple of weeks, is now back in the mix as the 49ers starter until Breida returns. He’ll almost certainly plod his way to 3.5 yards per carry and about 60 or 70 rushing yards per game and a possible touchdown. Or not. Blech. If you’re a Breida owner you may have no choice but to pursue Morris semi-aggressively. If you’re anyone else, you can probably do better. Charch’s Blind Bidding Recommendation: 10%. Just a reminder for PPR-leaguers, in particular, to check on Hines’ availability in your league. Still un-owned in half of all leagues according to Fantasy Pros, Hines took command of the Colts backfield last Thursday night. Marlon Mack could still muddy the waters if he ever returns, but Hines appears to have put Jordan Wilkins in the rearview mirror and now has attracted at least 9 targets from Andrew Luck in three of the Colts’ five games to date. Charch’s Blind Bidding Recommendation: 10%. Chris Carson returned from injury and served as the No. 1 back for the Seahawks in Week 5, but Pete Carroll was true to his word by keeping Davis heavily involved as well. Carson has rushed for over 100 yards in each of his last two healthy appearances and isn’t going away, but it appears the Seattle backfield may be effective enough to provide flex and/or bye week fill-in value for Davis as well. He’s also a potential league-winner if Carson were to suffer another injury. Charch’s Blind Bidding Recommendation: 5%. Juszxczcxzxczk is in his sixth NFL season and has carried the ball a grand total of 15 times. But, he’s always been a steady, if unspectacular, receiver out of the backfield. That skill was amplified in Week 5 after Matt Breida exited with an ankle injury, and Juszxczcxzxczk responded with 6 catches from dink-and-dunk specialist C.J. Beathard. PPR-leaguers, take note. Charch’s Blind Bidding Recommendation: 2%. A poor man’s Alfred Morris, The Other Alfred has gained a whopping 2.3 yards per carry across 33 rushes in the last two games. His 8 catches in Week 5 are an astonishing outlier, as he’s never had more than 15 catches IN AN ENTIRE SEASON coming into Week 5. Lamar Miller is not expected to miss any more time with the chest injury that kept him out of last week’s game, but Blue is (barely) worth keeping tabs on just in case Miller’s injuries continue to nag him. Honestly, unless your need is immediate and acute, you’d be better off stashing D’Onta Foreman, who reportedly should be ready to return in Week 7 off the PUP list. Foreman still has a lot to prove after rupturing his Achilles’ last year, but with Miller struggling and Blue being Alfred Blue, there’s a non-zero chance Foreman becomes a fantasy factor down the stretch. Charch’s Blind Bidding Recommendation: 2%. Like most people with eyes, you probably aren’t overly impressed with Lamar Miller or Alfred Blue. Almost certainly Bill O’Brien has eyeballs and feels the same way. Miller is averaging just 3.8 yards per carry, and Blue is somehow worse, averaging 3.4 yards per carry. D’Onta Foreman looms from the PUP list, eligible to return in Week 7, when he’d face the Jaguars. Charch’s Blind Bidding Recommendation: 1%. Coutee had a nice follow-up to his Week 4 breakout, but he clearly won’t be as much of a focal point once Will Fuller becomes healthy–assuming that ever happens. Coutee still showed a nice rapport with DeShaun Watson and should be a fixture in the WR3/flex conversation on a weekly basis moving forward. He’s also an excellent insurance policy to the injury-prone Fuller. Charch’s Blind Bidding Recommendation: 15%. Olsen’s ownership was much lower just a week ago, before he returned to the practice field and positive reports surfaced about his ability to play through his foot injury as soon as Week 6. He was still available in several of my highly competitive leagues, so it’s worth checking your league’s waiver wire just in case. There are no promises about how effective Olsen will be playing through the foot issue, nor about whether he’ll actually be able to make it through the rest of the season. But even a less-than-100% Olsen could be a huge upgrade over whatever other garbage you’re currently trotting out at the decimated tight end position. Charch’s Blind Bidding Recommendation: 30%, because half your league is looking for tight end help. Swaim was the Cowboys leading receiver in Week 5, which is a far more damning accusation against the Cowboys passing game than an accolade for Swaim’s performance. Be that as it may, Swaim isn’t injured like almost every other tight end in the league, and he now has at least 3 catches and 39 yards in each of his last three games. That’s how low the bar currently is in the apocalyptic 2019 Tight End Desolation. Charch’s Blind Bidding Recommendation: 10%, because half your league is looking for tight end help.